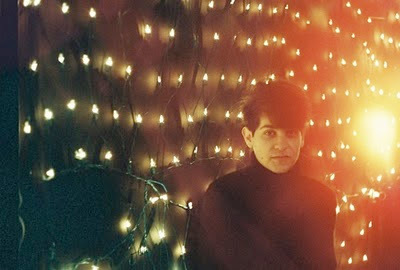 Therapies Son quickly won fans last fall when his humbly self-recorded demo of shimmering pop surfaced, catching the ears of some elite press and becoming something of an Internet sensation. 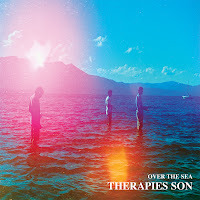 Therapies Son, the nom de tune of 19-year-old Van Nuys, CA songwriter Alex Jacob makes its official debut this weekend with a 5-track EP, Over The Sea via Jacob's management's label Sargent House. The EPs North American vinyl release is in conjunction with Record Store Day, April 16th. Over The Sea was initially released digitally (with a bonus track, "Golden Girl") by Sargent House and on limited edition 10" vinyl via UK blog/label Transparent on March 22nd. The band -- Alex with a drummer and bassist -- plays a free L.A. in-store show at Origami Viynl on April 21st at 7pm. Please see details below. 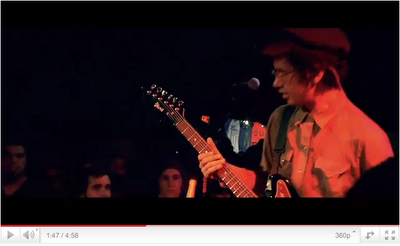 Pitchfork premiered the video for "Touching Down" recently, watch it HERE. Check out the MP3 for "Touching Down" HERE. Heartbreak has long been the lynchpin for many a glittering and storied musical career, and to that proud and varied lineage joins Therapies Son. Turning to music and tapping into an innate gift for songwriting after the painful dissolution of a relationship last autumn, Jacob started writing gorgeous, otherworldly songs which somehow managed, in the space of about 3 minutes or so, to absorb a library’s worth of the most glorious chapters in the Encyclopedia of Pop, ranging from Flaming Lips to Beach Boys to Grizzly Bear, before reflecting it back through its own uniquely cracked, fractured prism. On his debut EP Over the Sea, we have the to-ing and fro-ing, galloping playground pop jam “Rose Red Rose”, in which the initial whispered, tender intones make way for Technicolor orchestral bursts, glittering melody and breathless, merry-go-round waltzing, rubbing shoulders with the shimmering ebb and flow of the appropriately named “Still I Call”, opens up into something more vast, more widescreen, and, with its swirling strings and otherworldly beauty, absolutely not of this epoch. The exquisitely poised heartache of “Touching Down” meanwhile, sounds bizarrely all the more yearning with what sounds like an entire marching band behind it, while “Yellow Mama” kaleidoscopes a whole world of loss and longing into its short running time, Jacobs’ hushed vocals guiding the listener gently to a close. A truly one of a kind talent bound to break plenty of hearts of his own in the near future. 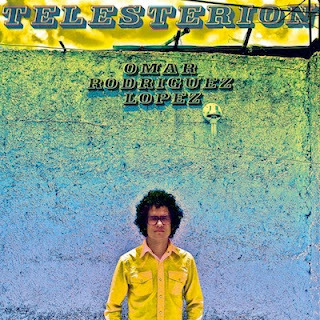 Telesterion, the extensive anthology of solo recordings by the immensely prolific Grammy Award winning recording artist Omar Rodriguez Lopez (The Mars Volta, At The Drive-In) is available this weekend on Record Store Day, April 16th. 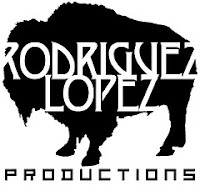 Plus, today Omar Rodriguez Lopez Group plays the Coachella Festival in Indio, CA amid their lengthy North American tour with support of sibling band, Zechs Marquise. Please see complete dates below. The extensive double CD, quadruple LP compilation features 37 songs (38 on the vinyl version) showcasing the variety and breadth of explorative artistry spread across his 25 (and counting) solo albums harvested for this release. Telesterion will be available on CD & LP at participating retailers on Record Store Day, April 16th, 2011 and digital download everywhere else on April 26th via Rodriguez Lopez Productions / Sargent House. Los Angeles' garage-punk revision of 60s chamber pop, Jail Weddings has released a new clip from their video endeavor as ambitious as the 10-piece band's size. Starting with previous releases of videos for "I Thought You Were Someone I Knew" and "What Did You Do With My Gun? 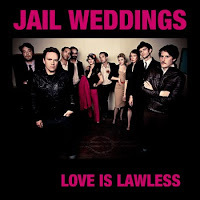 ", Jail Weddings is releasing new videos for each of the 13 songs on their recent album, Love Is Lawless. Watch their latest, "Tough Love" a pugilist's take on the battle games of romance featuring lead vocals by backup singer Jada Wagensomer as she beats the pulp out of frontman/songwriter Gabriel Hart. Consequence of Sound has the premiere HERE. Jail Weddings will also play a several west coast dates in coming months, including stints supporting Andre Williams, as well as being the R&B legend's backing band. Please see complete dates below. A new single 7" single, "It Was Nice To Be Loved" b/w "Digan Lo Que Digan" will be available on Record Store Day, April 16th. Love Is Lawless takes the pleading, wide-eyed romance of 60's pop-vocal idealist tantrums to subterranean levels never previously seen from this genre. A shadow has been cast over the fleeting Utopia of modern love, where we still wear such out of date traditions as marriage and monogamy like shackles on a chain gang. Who better to have cast this shadow then Jail Weddings - a soul-stricken modern day Wall Of Sound rock and roll behemoth, comprised of ten (yes, 10) grown men and women who at least have the guts to admit they have still have the emotional stability of an eternally wounded teenager. Fronted by Gabriel Hart (explosive frontman and mastermind behind the now defunct LA noir punks The Starvations), Jail Weddings is often described as "Nick Cave fronting The Shangri-Las." The band has carefully crafted these 13 songs over a three year period (since their actual inception in the summer of 2007), released October 2010 on the still skidding heels of two sold out singles and 2009's critically acclaimed EP Inconvenient Dreams (White Noise/Tru-Vow). Sure, they may siphon from the 60's pool, but do not confuse Jail Weddings as any kind of mere throwback act. The sphere of influence is vast, from the grandiose Scott Walker-esque soundscape of the album's existential opener "How Am I Alive?" to the E-Street Band gone to Hell epic "I Thought You Were Someone I Knew", to the Sparks meets Meatloaf bombastic melodrama of "What Did You Do With My Gun? ", the band proves its sound is unique as it is limitless. 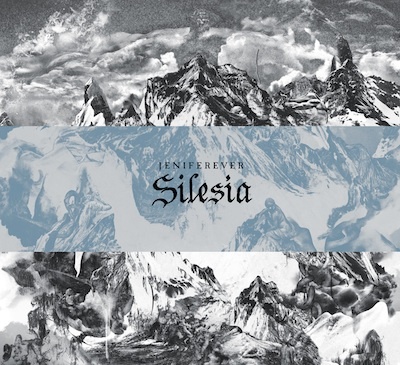 Uppsala, Sweden's cult-beloved atmospheric rock group Jeniferever have posted the first video from their forthcoming epic third album, Silesia. The animated clip for the song "The Beat of Our Own Blood" tells the true tale of director Ashley Dean's grandfather Jack Dean's brave escape from the coal mines of Silesia during WWII. 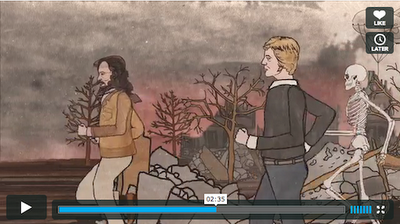 Consequence of Sound premieres the video (the first of three in a series) today, watch it HERE. Jeniferever is often described in epic terms: majestic, soaring, atmospheric, careening, sweeping. 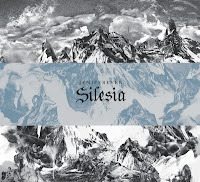 And, the quartet's forthcoming third album, Silesia (Monotreme Records) is a fitting example of their masterful meld of melodic pop songcraft with post rock's expansive sonic wanderlust. It is an album borne of tragic loss and motion. RCRD LBL recently premiered the MP3 from the video, "The Beat of Our Own Blood" -- download for free HERE. For further listening, check out other tracks from the album, "Waifs And Strays" HERE and "Dover" HERE. The album’s title is taken from the former name of Berlin’s Ostbahnhof. It was near here, while on tour in 2009, that Kristofer learned that his father had passed away. Reality bit where there was so often release; the structure of life on the road collapsed, and the band cancelled their remaining dates. Several months later, a third album began to form; while not wholly informed by the recent tragedy, nevertheless the collection bears its title with no little relevance. Said Kristofer, “I liked the idea of naming it after a railway station since it's a place of motion, a place where people arrive and depart and sometimes maybe depart never to come back...” And, the end product is Jeniferever’s brightest, most immediate long-player yet. From pain, confidence; from darkness, light. There’s a crack and strut to "The Beat of Our Own Blood", the album’s third track. “Goodbye to bright spotlights,” sings Kristofer, taking the listener into the belly of the urban beast, through a city’s trains and tunnels. "Deception Pass" might be the band’s heaviest song yet, drums and bass combining to kick up a turbulent maelstrom of menace. "Hearths" threads elegant atmospherics like satellite trails across a starry sky, and the title-track’s sentiment, while stemming from a single heart, is truly universal. Members of Jeniferever are available for interviews. Please contact Dave Clifford at dave@usthemgroup.com for more information. Chicago instrumental post-metal trio Russian Circles return to the studio today to begin recording material for a fourth album. Brandon Curtis of The Secret Machines & Interpol who produced the band's previous album Geneva is producing & mixing the new collection of songs at Phantom Manor in Chicago. This marks the band's first full-length to be released worldwide exclusively via Sargent House -- the band's longtime management company and record label that had previously released only the vinyl editions of its three previous albums. 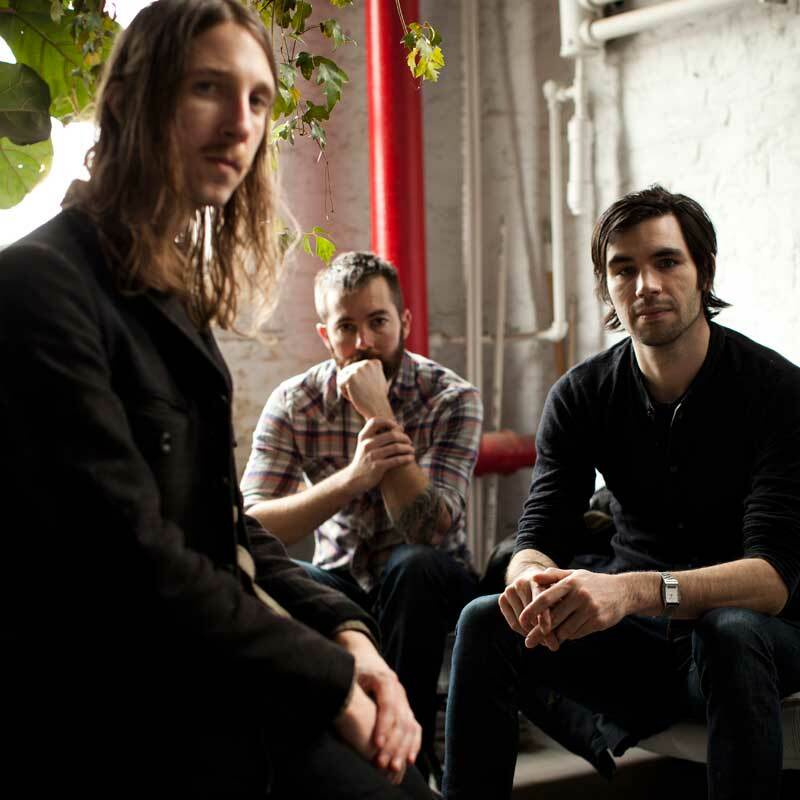 Russian Circles -- guitarist Mike Sullivan, drummer Dave Turncrantz and bassist Brian Cook -- will then take to the road this summer in Europe on a co-headlining tour with new label mates Japanese heavy-psych trio Boris. Tour dates will be announced soon. "A lot of the mood going into this album has been reflective on the last couple years of touring," Cook says. "We have a ton of new material. We're excited to get into recording and be somewhat sheltered from the outside world. We're going to try to make the same ebb and flow of our live set happen on the record, with more constructive dynamics and dramatic bridging between songs. We want to experiment in similar ways that we did with strings and embellishments on Geneva, but we don't want to have songs that won't sound the same in a live setting."